This Southern Onion Comfort Food post is a part of a paid promotion with the National Onion Association. I was compensated for this post, but all photos, words and opinions are my mine. I've taken all of the important and the subtle nuances of onions and layered them into this savory pie. It's a cross between a classic southern tomato pie, a buttermilk pie and an onion tart. The caramelized onions start in a slow cooker with sherry and thyme (if you feel fancy). Overnight, the translucent petals of white, yellow, red and sweet onions melt, become bronzed and bathe in their own juices to produce a cohesive tangle of skins that are baked under a mayonnaise and Parmesan crust inside of a buttery pie shell and garnished with a little bit of fresh chopped chives. It's super fantastic. Onions are literally the foundation of most every savory dish. The classic mirepoix combo of onions, carrots and celery is the first thing culinary students around the planet begin their education and it continues on to how to slice, dice and add onions to everything. Raw diced onions garnishing a bowl of pinto beans is the comfort food of winter time blues while fried onion rings are always a treat at fast food establishments. I was inspired by a pie I had at a friend's house. When I asked her for the recipe, I was surprised it was held together with just two eggs and a cup of Greek yogurt. Since I can never leave well enough alone, I went ahead to improve upon it. 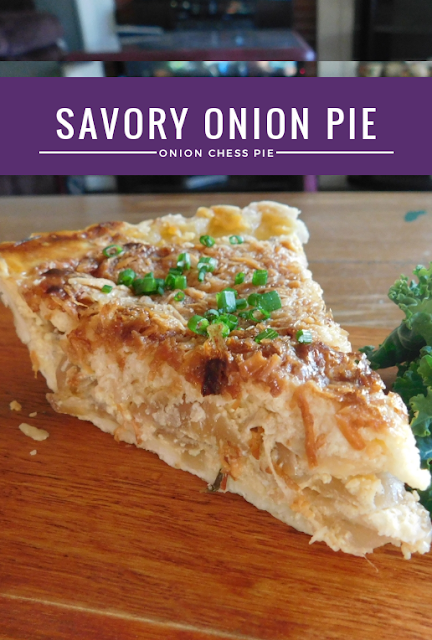 This pie literally has ALL OF THE ONIONS. They're not cut with potatoes, loads of cheese, bacon or spicy peppers. It's all onion, all of the time. A time-honored Southern-inspired pie, tomato pie, usually has a mayo and cheese crust and it's baked until the center isn't jiggly and the top is bubbly and brown. It's a thing of beauty. BUT--The magic literally happens in the Crock Pot over the course of 5 hours or overnight. The beauty of this recipe is the same onions are also used to make the next recipe, Slow Cooker 5 Onion Soup (stay tuned for that gem). Served with a fresh salad of mixed greens or kale, it's the perfect light lunch or light dinner. 1. Transfer all of the thinly sliced onions to the slow cooker — the slow cooker should be half to three-quarters full. 2. Cook for 5 hours on HIGH or 10 hours on LOW. 3. Stir occasionally, if possible — this will help them cook more evenly, but is not necessary. 4. After 5-10 hours, the onions will be golden-brown and soft, and they will have released a lot of liquid. Remove onions to a large bowl and let cool. 5. If you like onions with a deeper color, continue cooking for another 3 to 5 hours on LOW. Leave the lid ajar so the liquid can evaporate. Check every hour and stop cooking whenever the onions look and taste good. 7. In a large bowl, mix 3 cups of the cooled onions with yogurt, hot sauce, eggs and salt and pepper. Make sure all ingredients are well blended and then pour into 1 pie shell. 8. In a small bowl, mix grated cheese, mayonnaise, salt and pepper until well-blended. Spoon mixture on top of the onion mixture in the pie shell. 9. To prevent burning or over-browning the pie crust, cover the crust with aluminum foil. Bake in the preheated oven for 35 minutes. 10. Remove foil from the pie crust and bake for an additional 15 minutes, or until golden brown on top. Garnish with chives, if using. Let cool for a few minutes to settle before slicing. Pie can be served hot, warm, or at room temperature. Oh wow, That looks amazing. I love caramelized onions. I love pie. I love cheese. I like your comments regarding onions in cooking. I never really thought about how foundational they are, but it’s so true!